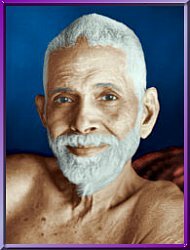 Sri Ramana Maharshi was born in 1878. In his 17th year he attained enlightenment through a remarkable experience as if undergoing death of the physical body while remaining in full consciousness. Following the transformation, he left his home and was drown irresistibly to the sacred hill of Arunachala. He never left it. In the ashram which was formed around him he taught the purest form of Advaita Vedanta (non-duality) through the supremely simple discipline of Self -Enquiry. Ramana Maharshi’s presence invoked a remarkable and transformational impression of benevolence and dignity, kindness and simplicity. which proved to be fundamental to the movement toward spiritual enlightenment in the Western world. Ramana saw God in everything. He had the utmost respect for animals, and there are many wonderful stories of his interactions with them, some of which I have recounted below. The most favored of all the animal devotees was a cow named Lakshmi. She was brought along with her mother as a gift to Bhagavan. He felt he could not properly care for the cows and so they were taken to farm in a neighboring village. After Lakshmi had been with the farmer for a year or more he went one evening to Ramanas ashram for prayers bringing Lakshmi and her mother with him for a visit. Lakshmi was irresistibly attracted to Ramana and must have noted carefully the way to the ashram. The next day she appeared on her own and from then on came every day returning, by herself the farm in the evening. At some point along the way she became a permanent member of the ashram. During her life at the ashram, Lakshme bore several calves at least three of them on Bhagavan’s birthday.. She was extremely devoted to Bhagavan and he showed her the utmost Grace and kindness. See the Books and Teachings Page for more information on Ramana Maharshi. 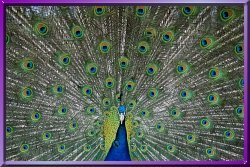 See the Meditation section for the article "Creating a Force Field of Love" for another story of Ramana and animals. Material for this article is taken from the book "Ramana Maharshi" and the "Path of Self-Knowledge" by Arthur Osborne and from stories that have been past along word of mouth by Ramana's followers.